SiPix Smart Cards | OhGizmo! I’ve been waiting many years for the point where e-paper becomes an actual consumer-ready product and not just a cool idea seen only in a laboratory or the occasional tech demo. Well with devices like Sony’s E-Reader almost/eventually upon us I’m starting to get excited about what other cool applications and ideas we’ll be seeing. One of those ideas comes from a couple of companies called SiPix and SmartDisplayer who’ve created the first flexible e-paper based display to be built into a plastic credit or debit card. 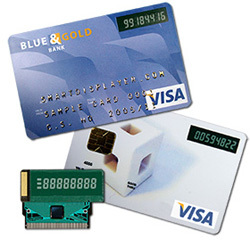 The ‘One Time Password’ Display Card allows the user to generate a dynamic unique passcode for one-time use. During an online transaction the cardholder can press a button on the card to generate the unique number which when entered on the website they’re making a purchase from proves they have the actual card in hand. While it doesn’t stop people from stealing and using your card, it will prevent people from making purchases when all they have is your credit card number. The best part is the e-paper used in the card will be mass produced by SiPix and made available to banks and other card manufacturers by years end. Interesting idea, but I’m curious about how unique the number is. I’m assuming that the number isn’t transmitted from the card to the bank, so how does the bank match up the number on the card with the one you type into a website? It seems to me that it would be some sort of algorithm based upon the credit card number and the date. Once the algorithm is figured out it will be useless because all the cards sent out have already been hard coded. They must have thought up something creative to thwart this but I’m at a loss to see what it is.